So you hear these stories of these women who get little flutter kicks from their unborn child, things that are “lovely” and “miraculous”. When I was pregnant with Jackson, his kicks were more like “holy hell” and “uggggghhhhh” and “OUCH” and “damn kid, are you trying to learn kickboxing in there?”. Those are his feet from about a week old. And while this is one of my favorite photos I’ve taken to date, his feet, they astound me. They are giant monkey feet (for a newborn)–about the length of my palm. 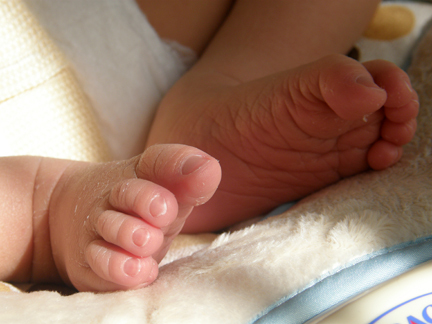 From day one, newborn socks did not fit this child–and some 3 month pairs are a stretch. We got a few pairs of newborn shoes as gifts (silly, but cute)…not a single pair will ever have graced his feet as they were all too small the day he was born. We’re going to spend so much money on shoes for this kid as he gets older. Wow, and I thought my daughter’s were huge. We called her “flipper foot” because we like to mock children like that, what can I say? Still adorable though, baby feet and toes are just the tops. Good job growing that baby Momma! Haha, you got a little soccer player there! Isn’t that SUCH a stupid thing to say?